Why hasn’t Trump tweeted that his button is larger than the Saudis non-existant button? It will hurt them far more then it will hurt us. And it will hurt China really bad. China is the one that imports Saudi oil. US motorists will pay 5 bucks a gallon if they cut off the spigot. Chinese motorists won't be able to buy oil for any price. A top state-linked Saudi media figure has warned that imposing US sanctions on Riyadh in response to the Khashoggi crisis could lead to Russia opening a military base in the kingdom. The general manager of a Saudi-state-owned media company published an op-ed Sunday suggesting that if the U.S. imposes sanctions in response to the disappearance of Washington Post columnist Jamal Khashoggi, the situation will get so dire that Saudi Arabia would allow Russia to install a military base in the nation. So muslim Erdogan lied again! President Trump suggested that “rogue killers” could have been behind the disappearance of a Saudi dissident journalist, as he dispatched his secretary of state to Riyadh to meet with Saudi King Salman. When you are innocent you have that right. Oh no! A Russian military base in Saudi Arabia! Oh no! Yeah, whatever the actual strategic value of such a base, let's not pretend that the prospect of it wouldn't result in a total meltdown in DC. "i'm surprised Saudis didn't claim they were framed by Turkey"
Or that a team of Iranian seals hijacked the guy from the consulate and flew him to Iran where he was killed by hanging. Why don't turkey and Saudi Arabia both just blame isis? Or the kurds? Or the jews. Actually Trump is on the same track. He thinks that it is someone else who killed that guy. Rogue killers. It could be the jews. Who knows? ”US President Donald Trump said Monday that "rogue killers" could be to blame for the disappearance of a dissident Saudi journalist and said that the oil-rich state's monarch emphatically denies involvement. "Just spoke with the Crown Prince of Saudi Arabia who totally denied any knowledge of what took place in their Turkish Consulate." 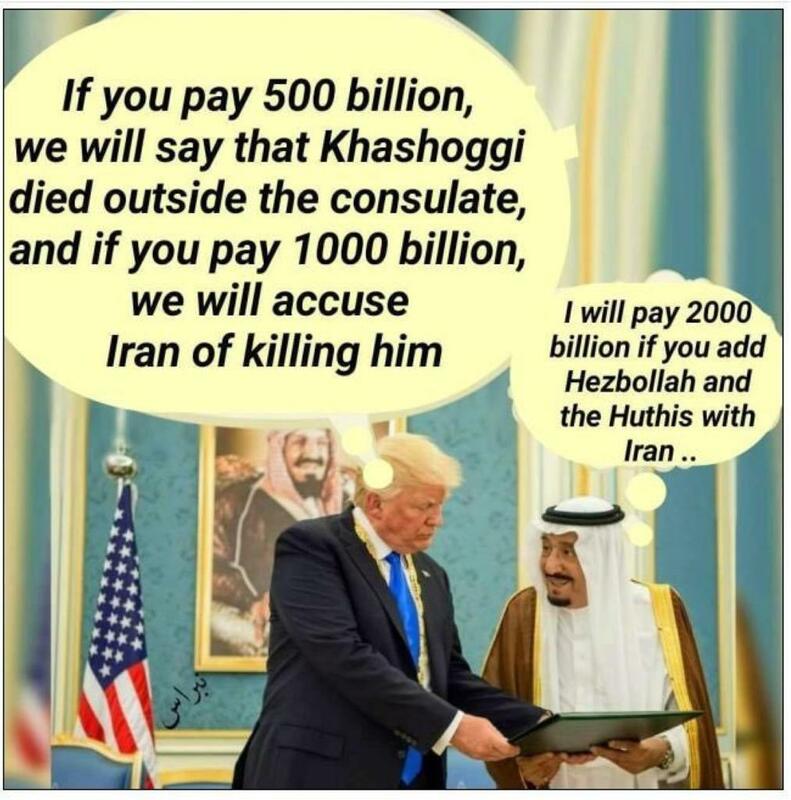 Yeah, Trump is now the lawyer of Saudi Barbaria and ISIS. I wonder how much he is getting paid. Who was it that sent the ISIS Death Squad to the consulate in Istanbul? It could have been none other than the King of ISIS. The Saudis have arrested 18 people in connection with his death. complete with the idiot puppet claiming Saudis moving faster than expected... really? King Salman made a similar condolence call, the kingdom said early on Monday, as international pressure on the Saudis to provide an satisfactory account of what happened to Khashoggi continued to rise.